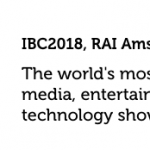 2-IMMERSE was well represented in the Future Zone at IBC – the world’s leading media technology exhibition – over the weekend, from 13-18 September. Team members had the chance to meet, address and learn from more than 57,000 of the most engaged power brokers and technical analysts in media and entertainment. 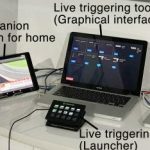 In addition, we launched the open source software that underpins the multi-screen personalised TV demos that 2-IMMERSE has developed. 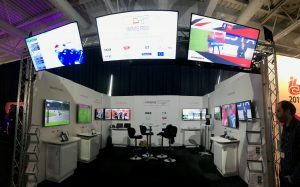 Apart from the stand in the Future Zone, results from the project, including a compelling rationale extolling the benefits of object based media approach used by the project, were also delivered at the IBC conference by Ian Kegel on behalf of the wider team. 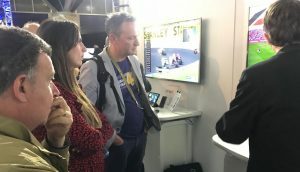 From left, Fergus Garber, Gemma Knight and Jamie Hindhaugh with Ian Kegel learning about the Football at Home prototype. 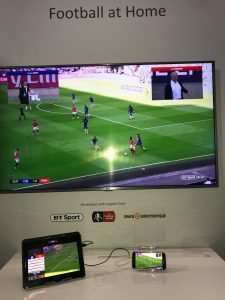 Many important industry stakeholders were there including Jamie Hindhaugh, COO BT Sport, who said, ‘This is the best thing I’ve seen at IBC; you just know that has been designed with the fans in mind, I think it’s beautiful.’ We also rubbed shoulders with producers, directors, technologists, analysts and broadcasters from all over Europe and around the world. 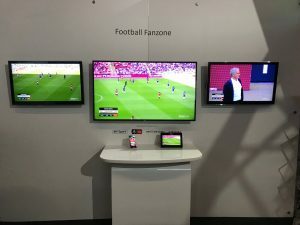 Visitors to the stand were particular encouraged to see that the project’s software contributions were being made available through open source software licenses and every time we showed the Fan Zone demo, they smiled. We lost count of the number of times we were told ‘I like that’ and ‘this is the future’. As the teams disperse back to their work places we’re encouraged, feeling our focus on exploitation is paying dividends.